We will be closed today, Monday, Sept 4, in observance of Labor Day. 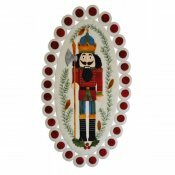 We will reopen on Tuesday, Sept 5, at 10:00 a.m.
Nutcracker Table Runner. Yet another beautiful project from the book, "Gorgeous Wool Applique"! You'll learn how to applique on wool and enhance your project with different embellishment threads and stitches. Beth will also teach the "big-stitch" quilting technique to finish your project. Beth Kondoleon, 3 sessions - 3rd Wednesday -- Sep 20, Oct 18, Nov 15, 10:00 a.m. to 1:30 p.m., supply list (including the book). Sue Spargo Needle Keeper with Bird. Here is another beautiful, usable Sue Spargo project. 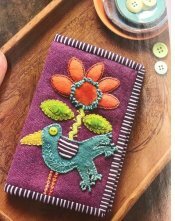 Join Judy for a fun class learning felted wool applique, fabric layering, and gorgeous embellishments with all kinds of threads and stitches. This project is great for beginners, but more advanced students will love it, too. Judy Cummings, 4th Mon (Sept 25, Oct 23, and Nov 27), 9:00 a.m. - noon. $45 for three sessions. Students must purchase pattern. Big Stitch Quilting. You've probably been hearing a lot about Big Stitch Quilting. Big Stitch Quilting is hand quilting with a larger thread and needle, and it adds beautiful color, depth, and texture to quilts. You can use straight lines or use a more intricate design from a quilting stencil. With the variety of threads and designs, the possibilities are endless. Beth will be teaching "mini" classes to get you familiar with the technique. Bring a project to quilt or just bring something to practice on. Saturday, Sept 30, 10:00 a.m. 12:30 p.m. -OR- 1:00 - 3:30 p.m., Beth Kondoleon, $10, supply list. Tuffet Class. Tuffets are all the rage! They can be whimsical, elegant, scrappy, or made to match any room. This is a 2-session workshop, and you'll have a completed tuffet at the end of the class! Session 1 is sewing and learning the technique to make the foundation pieced Tuffet cover. Covers are finished at home prior to Session 2. In Session 2, we assemble the upholstered form. The instructor will bring the tools needed for construction. Tuffeteers can purchase one of the instructor's finishing kits ($125) or gather the materials themselves. Pattern purchase is required ($28). You must be an intermediate quilter/sewer and have a good working knowledge of your sewing machine. Jill Schlageter, Thu, Oct 5 & 19, 10:00 a.m. - 1:00 p.m., $60, supply list (pattern required for class). 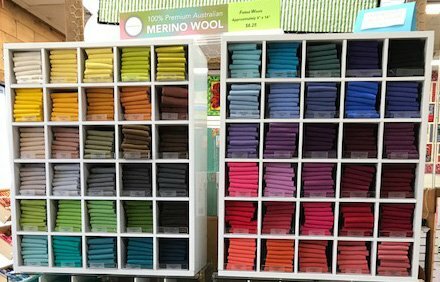 Sue Spargo's new mill-dyed wools (above) are dyed to match her new Ellana wool threads, and they are beautiful! Sixty gorgeous colors to choose from! 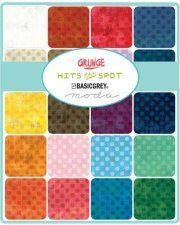 Moda's Grunge line has been so popular that they've created Grunge Hits the Spot (right), and we have all twenty colors! 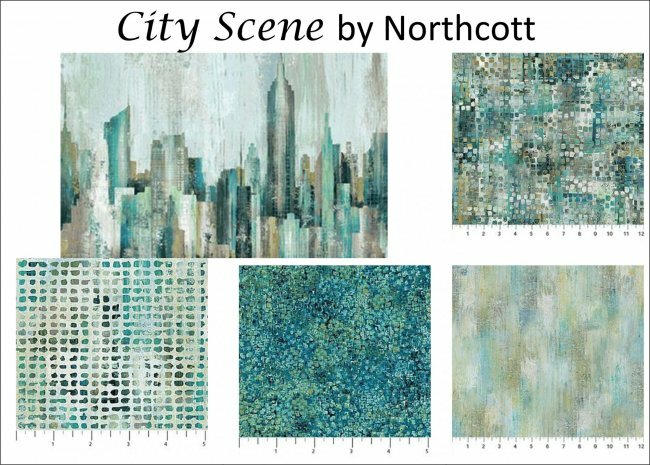 City Scene is a wonderful graphic collection in teals and greys from Northcott. There are 11 designs in this collection; we've highlighted just a few of them below.